Although nat­ural slate roof­ing can be beau­ti­ful, it can be extremely heavy and expen­sive. Cer­tain­Teed man­u­fac­tures var­i­ous roof­ing shin­gles to repli­cate the look of nat­ural slate roofing. What are the advan­tages of asphalt shin­gle roof­ing ver­sus nat­ural slate roof­ing? The authen­tic depth and dimen­sion of nat­ural slate roof­ing can now be achieved in asphalt roof­ing shin­gles. Cer­tain­Teed man­u­fac­tures high-quality shin­gles under the names Grand Manor™, Cen­ten­nial Slate™ and Car­riage House™. These prod­ucts cap­ture the clas­sic appeal and endur­ing beauty of natural-cut slate roof­ing at a frac­tion of the cost. What are the advan­tages of syn­thetic slate roof­ing ver­sus nat­ural slate roofing? CertainTeed’s Sym­phony™ Slate is an inno­v­a­tive roof­ing prod­uct sim­u­lat­ing the appear­ance, tex­ture and con­tours of tra­di­tional nat­ural slate roof­ing. Sym­phony is a care­fully engi­neered poly­mer com­pos­ite roof­ing prod­uct designed for beauty, dura­bil­ity, and easy-handling. It is sim­ple to install and at a frac­tion of the weight and cost of nat­ural slate roof­ing. 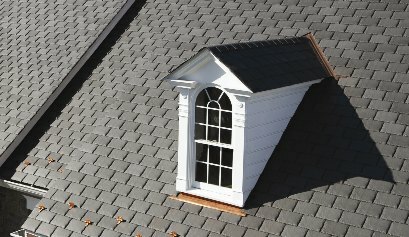 It is shat­ter resis­tant unlike nat­ural slate roof­ing that can shat­ter when walked upon or in cold weather. This also means eas­ier instal­la­tion and less waste.